King Memorial to Join a Crowded Mall Landscape As history marches on, space for memorials on the National Mall in Washington, D.C., is shrinking. The Martin Luther King Jr. Memorial, which officially begins construction Nov. 13, may perhaps be the last monument to be built on the parcel. 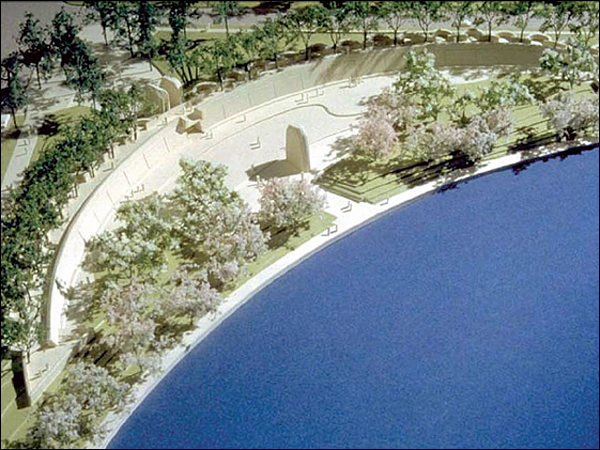 Aerial model of the King Memorial, from the Tidal Basin. 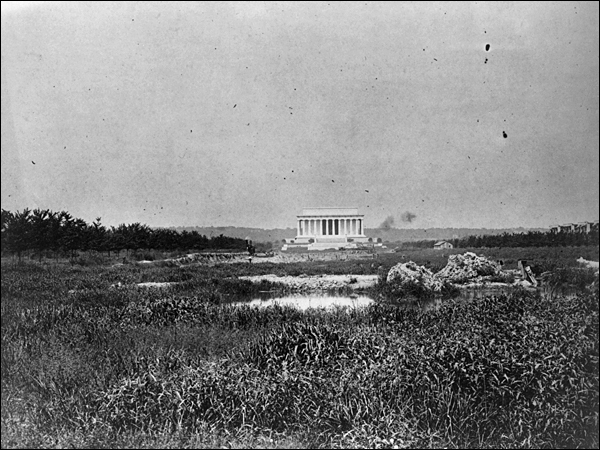 This 1917 shot of the Lincoln Memorial, with marsh in the foreground, shows a period when key parts of today's National Mall looked less appealing. As history marches on, space for memorials on the National Mall in Washington, D.C., is shrinking. The Martin Luther King Jr. Memorial, which officially begins construction on Nov. 13, may perhaps be the last monument to be built on the parcel. 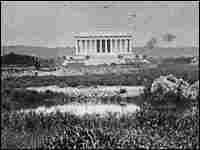 The King memorial will be built on one of the Mall's prime pieces of real estate, across from the Jefferson Memorial and just behind the cherry blossom trees that ring the Tidal Basin. They bloom in April, the month when King was assassinated. 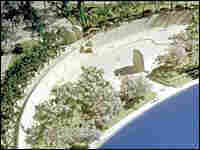 The site for the Martin Luther King memorial was approved in 1999. 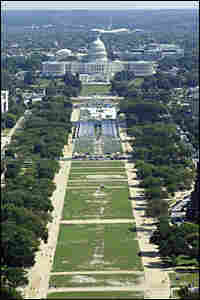 In 2003, concerns about crowding led Congress to impose a moratorium on new buildings and memorials on the Mall. Since the moratorium was enacted, organizers of future memorials must now choose among sites scattered throughout the city of Washington. The Eisenhower Memorial Commission, for example, just got approval to build on a plot of land across the street from the enormously popular Air and Space Museum. The memorial will be outside the main part of the Mall, but not by much. Judy Feldman, head of the National Coalition to Save Our Mall, notes that Congress has already made exceptions for a Vietnam Veterans Memorial visitor center, and for the African American History Museum. Feldman argues that because of the competition for space, the Mall should be extended. She proposes annexing Banneker Memorial Plaza, an uninviting little park that seems an unlikely tourist attraction. 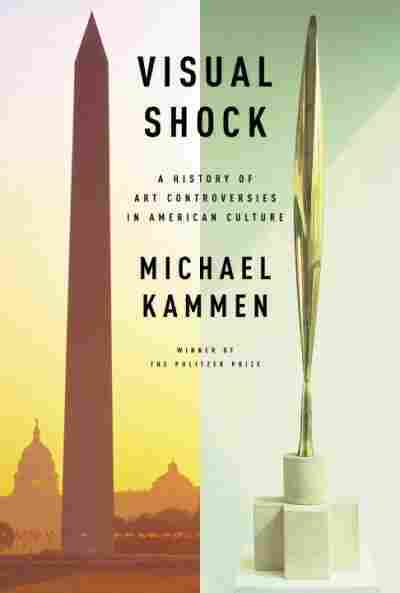 But Michael Kammen, author of Visual Shock: A History of Art Controversies in America, notes that the west end of the Mall, home now to the Lincoln Memorial, Vietnam Veterans Memorial and Korean War Memorial, "was a marshy swamp." The space has always been a shifting landscape, Kammen says, despite perceptions of the Mall as a sacred, inviolable space. The National Capital Planning Commission has extensive plans for dealing with the crowding problem. One way or another, says Judy Feldman, change is inevitable. History never stops; there will always be more presidents, heroes and wars needing to be memorialized.